Product information "Milka Chocolate Easter Bunny Crispy - Schmunzelhase Knusper 50g"
The Milka Schmunzelhase „Crispy“ is a chocolate hollow body and consists of smooth melting Alpine milk chocolate and crispy cereal flakes. A real treat for anyone who likes it crispy! 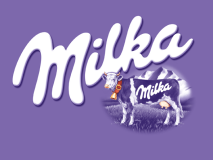 Related links to "Milka Chocolate Easter Bunny Crispy - Schmunzelhase Knusper 50g"
Nutritional information per 100g "Milka Chocolate Easter Bunny Crispy - Schmunzelhase Knusper 50g"
Ingredients "Milka Chocolate Easter Bunny Crispy - Schmunzelhase Knusper 50g"
Zutaten: Zucker, Kakaobutter, Magermilchpulver, Kakaomasse, Süßmolkenpulver (aus Milch),Buttereinfett, Reismehl, Haselnüsse, Emulgatoren (Sojalecithin, E471), Weizenmalzmehl, Palmfett, Speisesalz, natürliches Aroma. Kann andere Nüsse, Ei und Lupinen enthalten. Responsible food company: Mondelez Deutschland GmbH D-28078 Bremen. Made in Germany. Customer evaluation for "Milka Chocolate Easter Bunny Crispy - Schmunzelhase Knusper 50g"